Dorothy Frances Kearsley – who died in Suva on August 3rd – was born in Suva on March 13 1916, the eldest daughter of William and Constance Kearsley. She was from one of Fiji’s old European families, her great-grandfather, Captain Petrie, having arrived in Fiji in 1880. Her grandfather, Herbert Ambler, was Town Clerk in Suva at the turn of the nineteenth and twentieth centuries. 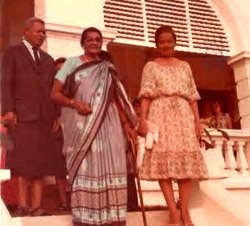 Her mother, Connie Kearsley, was born in Suva in 1892 and died in the capital in 1972. Her father worked as a telecommunications engineer for Amalgamated Wireless Australasia, which became Cable & Wireless, and the family lived at wireless stations at Vatuwaqa, outside Suva, Vaturekuka, outside Labasa, and at Waiyevo on Taveuni. In the 1920s and 30s, young Dorothy was sent to Suva Girls Grammar School where she excelled academically and was top of her year, receiving a gold medal as dux of the school. For part of her education, Dorothy stayed at a boarding hostel in Suva and only saw her family during school holidays. On a boat journey home at the age of 14 to spend Christmas with her family on Vaturekuka Hill, the CSR vessel carrying her, the Rani, lost radio contact at sea in a hurricane. Her worried parents had to wait two days before hearing that the ship had run aground on the west of Ovalau and all on board were safe. After leaving school, Dorothy trained with Mrs Kermode in Suva as a stenographer and court reporter. She worked in that role for the initial part of her career, first in Suva with Morris Hedstrom and then with the Fiji Government before she left for England. There, she worked for a time for the distinguished ballerina, Margot Fontaine. Then Dorothy headed for Africa and the British colony of Tanganyika, now Tanzania. She worked in the capital, Dar Es Salaam, as a Hansard parliamentary reporter and then joined the private office of the independence leader, Julius Nyerere. Dorothy finally returned to Fiji in her forties and became the World Health Organisation’s office manager in Suva. Dorothy was an accomplished artist throughout her life, painting mainly in oil. She was awarded various prizes for her art, including the Fiji Arts Club annual prize. In her retirement, she lived at Suva Point in the same house that her parents had lived in. It was not far from the wireless station and home where she had grown up with her four sisters – Betty Gurd, Joyce Scherrer, Nancy Thomson and Elima Higgins – and her brother Peter Kearsley. In the twilight of her life, Dorothy was lovingly looked after by her carers, Akosita Seniyevo, Elena Rawatanaveitarogi-Whiteside and Joanna Alania and her Suva Point neighbours, Anne and Bob Harness. She is survived by her two younger sisters, Joyce and Elima, who live in the United States, and by her brother, Peter, who lives in Auckland. The family’s connection with Fiji continues. Her grandniece, Nicky Thomson, lives in Suva, and her nephew, Douglas Thomson, lives in Nadi. This is a true and remarkable Fijian. Fijians and Fiji can only learn from the life story and earn from the immense contribution to Fiji. In this case art amongst others. I send my condolences to her family. I would really like som one to also write about Paul Hilton. That is another remarkable Fijian. In his late nineties and still looking after cripple children at the Hilton Cripple School. This Fijians like Paul Hilton deserve a medal of honor from the goverment of Fiji. I had the honor of meeting Paul Hilton many years back when I was in school. I met him during one of our field trips to the Hilton Cripple School. What a gem of a gentlemen I fornd him back then!!! And, gems, the older it gets, the shinier it becomes. And so is Paul Hilton. He is a great Fijian, and should be honored aptly. May I add my condolences. 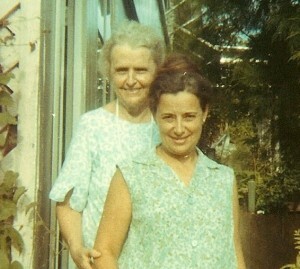 I was privileged to spend many occasions with Dorothy at Suva Point, trading stories and generally talking about life. She was amazing. Thank you, this was very interesting. Her brother Peter was a classmate at Suva Grammar of Don Dunstan, former premier of South Australia. I came across your website when trying to find information about him, to include in the biography I’m writing. Please get in touch if there is anything you think I might like to know.